I am now booking 2019. There are limited spots on some of the specialty courses. Email to inquire about availability. Bladesmithing is an important part of blacksmithing. The cultural importance of knives goes back to the earliest dawn of humans as tool users. The knife is a fundamental tool in ancient or modern lives. Knives have been simple sharp tools for everyday use or elevated to art forms that incorporate precious metals and stones. 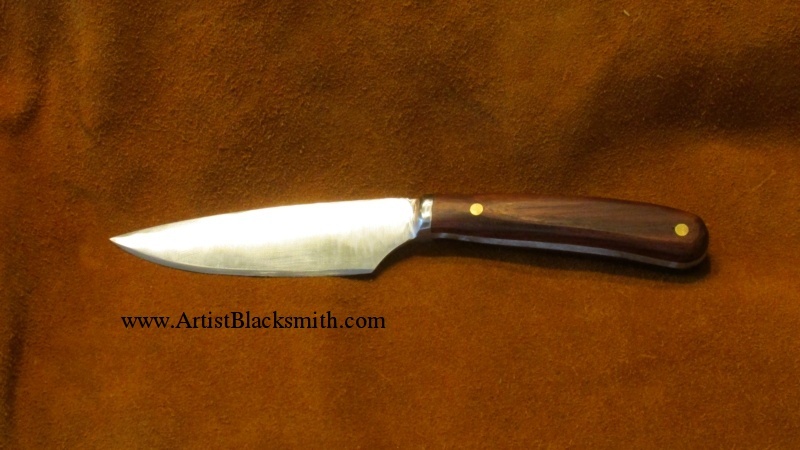 Knife Making has moved beyond craft to become, in some cases, sculptural art. With the various knife making courses that David offers, he hopes to teach the fundamentals of bladesmithing to give the student the best foundation for more advance bladesmithing and more experimental knife making. With knife making attention to detail becomes of critical importance. Although not difficult forging techniques, the use of alloy steels require a high level of precision in execution. The general focus is on the correct hot forging of the blade with various grinding techniques to produce a one of a kind functional knife that the student can use. .
"I invite you to take a look at my current bladesmithing and knife making course offerings! If you don't see something that fits your schedule let me know and we will see what we can arrange. All classes are taught at my workshop in Cargill." Knives are a fundamental tool in our lives whether it be in our kitchens, workshops, or on hunting trips. 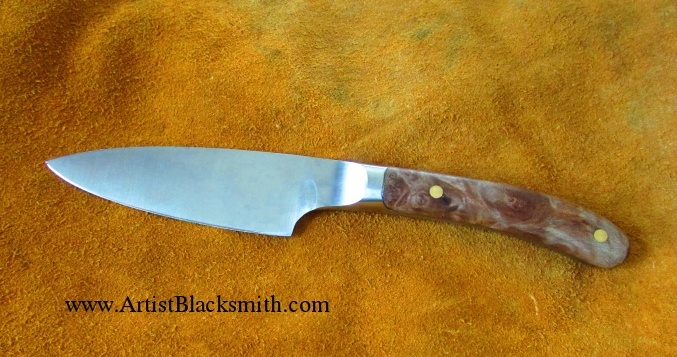 I have had many requests for a knife making work shop and have usually suggested people do some blacksmithing first. There is a need for hammer control and an appreciation for the narrow temperature range that the tool steel must be worked at and these things do require time to grasp. It is recommended that you have some past forging experience, but I will try to accommodate those that have no experience as well. This course will concentrate on blade formation and heat treating, with less emphasis on grinding. Some grinding will be involved but it will not be the main focus. I hope each student will be able to complete 2 knives at least to the point that they can finish them at home. This will of course depend on experience and ability. The 2 knives will be a Romano- British pattern (one piece blade and handle) and a drop point skinner with riveted slab handles. 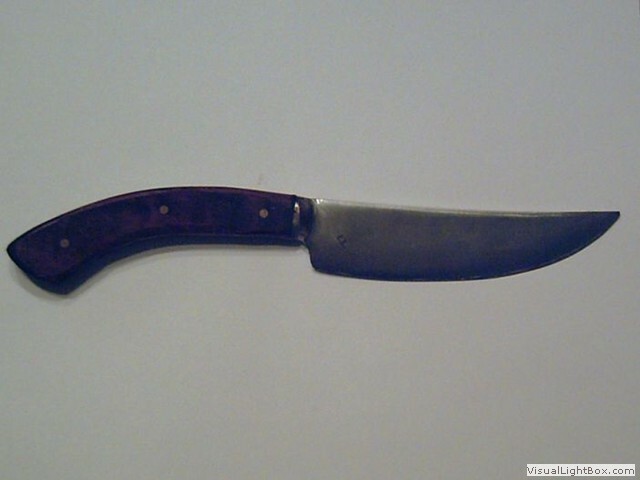 The class may tackle a stub tang knife and an integral bolster if time and ability allows. These projects may change without notice. With this course I expect that you can do some limited wood working at home with simple hand tools to finish the blades. My goal is to have all the metal work done. Previous experience with forging hot metal and making of knives even if just stock removal is required. My goal is to have the students focus on the details of design and solid craftsmanship to produce complete hand forged knives of their own design that include integral bolsters. This course concentrates on sanding techniques appropriate to fit and finish of the knives and the handles. One Day Specialty Blacksmithing Classes | Courses! at our mutual convenience. Additional material charges possible. For $500.00 per day I will work on your particular project with your help. Other dates may be arranged for 2 or more people. For blacksmithing and bladesmithing / Knife Making classes deposits and final payments I now accept Pay Pal and email funds transfers as well as the usual cash, cheque or Visa. Items can be paid for by Pay Pal or Visa or Master card over the phone. Please contact me for availability of courses. 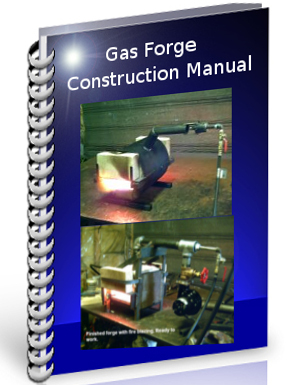 Learn How to Make Your Own Gas Forge Here!